Sepp Blatter, FIFA's long-time president, announced on Tuesday that he will be resigning as soon as an extraordinary FIFA congress has elected a successor. Blatter had won a fifth term as president just last Friday and seemed to feel vindicated in two victory speeches, after yet another round of bribery scandals had beset him and his organization. A recent indictment by the U.S. Department of Justice had led to the arrest of nine of his close associates last week, and ABC News reported Tuesday that Blatter is, in fact, a subject of that continuing investigation. The sudden relinquishing of his iron grip on FIFA comes as a total shock to the soccer world, which had assumed Blatter would remain in power through the end of his new four-year term, extending his reign to 21 years. After defeating Prince Ali Bin Hussein 133-73 in the first round of Friday's election, the Jordanian challenger withdrew from the run-off vote. Blatter seemed to have once again consolidated his vast power, acquired over some four decades at the world's most popular sport's governing body. Blatter didn't explain what triggered his resignation. Part of the FBI investigation that led to the DoJ's indictment, however, had accused South Africa of buying votes from the CONCACAF region, which includes the United States, that ultimately landed it the 2010 World Cup. Subsequent reports out of South Africa in the last 24 hours then produced a letter seeming to show that the $10 million payment had been funneled through FIFA directly, and that secretary general Jerome Valcke, Blatter's right-hand man, had personally overseen the transaction. "I have been reflecting deeply about my presidency and about the 40 years in which my life has been inextricably bound to FIFA and the great sport of football," Blatter said in his address Tuesday. "I cherish FIFA more than anything and I want to do only what is best for FIFA and for football. "I felt compelled to stand for re-election, as I believed that this was the best thing for the organization," he continued. "That election is over but FIFA's challenges are not. FIFA needs a profound overhaul. While I have a mandate from the membership of FIFA, I do not feel that I have a mandate from the entire world of football – the fans, the players, the clubs, the people who live, breathe and love football as much as we all do at FIFA. Therefore, I have decided to lay down my mandate at an extraordinary elective Congress. I will continue to exercise my functions as FIFA president until that election." Blatter urged FIFA's executive committee to put on the extraordinary congress "at the earliest opportunity." The next one on the regular schedule is slated for Mexico City on May 13, 2016, but Blatter argued that waiting that long would "create unnecessary delay." Domenico Scala, chairman of FIFA's audit and compliance committee, said a special election could be held between December and March of 2016. "Since I shall not be a candidate, and am therefore now free from the constraints that elections inevitably impose, I shall be able to focus on driving far-reaching, fundamental reforms that transcend our previous efforts," Blatter added. "For years, we have worked hard to put in place administrative reforms, but it is plain to me that while these must continue, they are not enough. "I have fought for these changes before and, as everyone knows, my efforts have been blocked. This time, I will succeed." 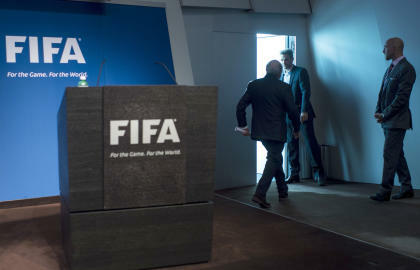 Scala will oversee the electoral committee and assist in Blatter's promised reforms. "The decision that he has made today was difficult and courageous," Scala said in his own address. "In the current circumstances, this is the most responsible way to ensure an orderly transition. I know that he has truly acted with the best interests of FIFA and football in his heart." Scala indicated that FIFA's statutes require a four-month notice for presidential elections and, also requiring time to vet candidates. "For years, FIFA has worked hard to put in place governance reforms, but as the president has stated, this must go further to implement deep-rooted structural change," Scala said. "The president has outlined a number of specific recommendations to achieve this. A number of these steps have previously been proposed but have been rejected by members. "Today more than ever, FIFA is committed to ensuring that these changes are implemented and upheld. As part of FIFA's work, the organization will re-examine the way in which it is structured. While it would be premature to speculate on the outcomes of this work, nothing will be off the table." Blatter, in closing, claimed that he had made his decision in the best interest of soccer. "It is my deep care for FIFA and its interests, which I hold very dear, that has led me to take this decision," he said. "I would like to thank those who have always supported me in a constructive and loyal manner as president of FIFA and who have done so much for the game that we all love. What matters to me more than anything is that when all of this is over, football is the winner."